Raja Ampat, or Four Kings, located in Indonesia’s West Papua province sits conveniently at the top of the list. According to Experts, it’s difficult to spot anywhere else in the globe that compares to it. It is said to have the world’s greatest concentration of marine life for a region of its size and 75% of all known coral species in the globe. It houses more than 1,000 dissimilar species of fish, sea turtles, sharks and manta rays, and offers snorkelers the chance of snorkelers of coming up close with fish and coral in every direction while swimming. This waters of this archipelago, consisting of 50,000 square kilometers of islands and water grants a brand new experience and something different each day to snorkelers. Here is another world’s snorkeling destinations situated in Indonesia. The abundance of underwater life and corals in Indonesian Komodo is well-kept alive since it has been a World Heritage Site for more than 30 years. The reefs and islands of this Indonesia national park are heavily protected and the park is one of only five islands in the world where you can see Komodo dragons in the wild. The marine life is also well fed and gives you different experience as well. You might snap over some friendly sea-lions during your Galapagos snorkel. Snorkeling in Ecuador’s Galapagos Islands doesn’t revolve around colorful coral and tropical fish, but it is a spot you can discover huge marine life including sea lions, sharks, dolphins, turtles and even penguins.This spot which forms the basis of Charles Darwin’s Theory of Evolution, provides snorkelers unique and alluring mammals both on land and beneath the sea. The Coral Triangle is the center of the world’s marine biodiversity, stretching from Eastern Borneo all the way across Bali, the Philippines, most of Indonesia and the Solomon Islands. It caters to 75% of all known coral species in the globe and covers 647 million hectares of land and sea. More outstandingly, snorkelers don’t have to go too deep to see the region’s 2,000 species of reef fish, as they hang out just below the surface. 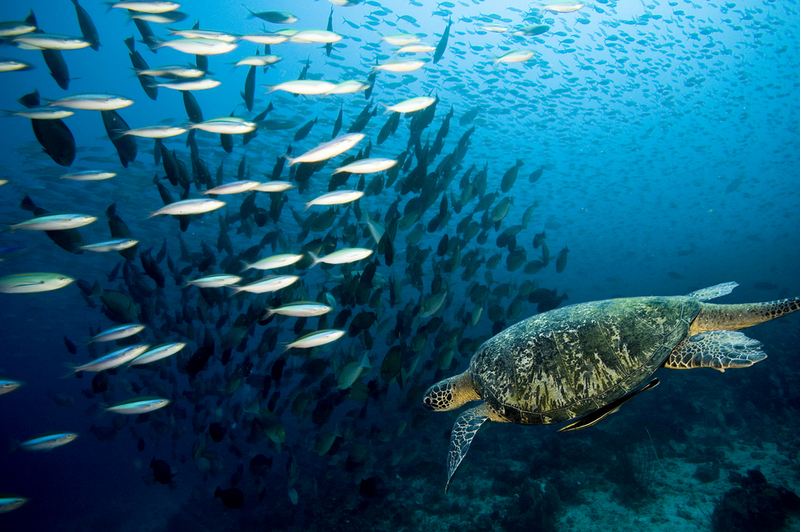 Additionally, this spot houses six of the world’s seven marine turtle species. This is one of the most amazing places for underwater activity. It features more than 7,000 islands, and houses one of the most populous and diverse ecosystems on the planet. A remarkable exceptional quality of this spot is the Bay of Donsol, home to whale sharks, the world’s biggest living fish. 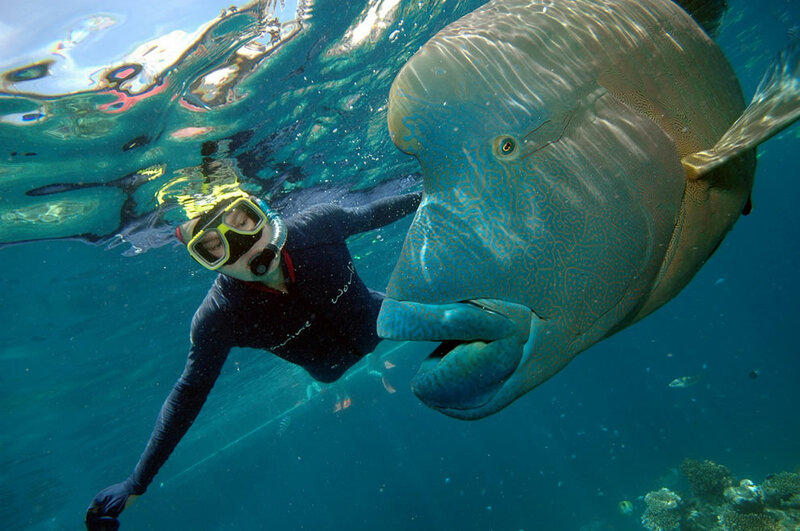 Visitors have the opportunity to swim close to these gentle and friendly giants. Noa Noa Island, which has thousands of colorful reef fish and thriving reefs also worth checking out. Silver Bank, off the coast of the Dominican Republic, is another hot spot in the world where humans can swim and snorkel. It’s in a fairly shallow stretch of the Caribbean Sea, making it out-of-bounds for big ships. As a result, it is a safe place for the North Atlantic humpback whale population to mate and give birth. Visitors are granted the chance of catching up with humpback whales while swimming. Visitors who want to have this experience can just get around this spot between December and April, when the humpback whales passes through the area. Snorkelers can hover above a “blue hole” in a Palau reef while swimming with jellyfish without that will not give you a spiteful sting. 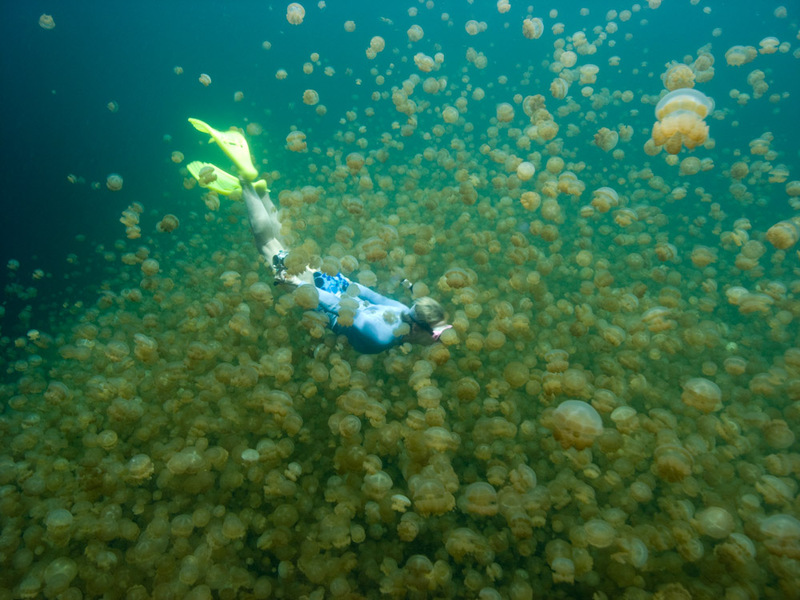 The Jellyfish Lake, Palau is occupied by millions of harmless jellyfish. But it isn’t just jellyfish that got it on the list of the world best destinations for snorkeling, Palau’s shallow and healthy reefs house a variety of corals, clams, fish and other species. Visitors can catch up with beautiful marine life including turtles, tropical fish, manta rays and sharks. Great Barrier Reef consists of 2,900 individual accessible reefs and 900 islands and stretches more than 2,300 kilometers, making it the planet’s biggest coral reef ecosystem. This gorgeous Great Barrier Reef is off the coast of Australia, in the Coral Sea. It brims with a diverse range of fish and coral has been existing for half a million years. Snorkelers are allowed to easily reach the reefs of this great spot. To a regrettable extent, scientists reveal it could become extinct as soon as 2050 based on climate change. Increasing levels of carbon dioxide in the atmosphere are making oceans to warm and bleaching the reef’s corals to death, Scientists added. Solomon Islands, located in the eastern tip of the Coral Triangle are a known unspoilt paradise. They are quite popular for being among the coolest destinations for those who love scuba diving. Part of their fame comes from so many sunken warships existing in it as some of World War II’s most bitter South Pacific battles happened here. Solomon Islands snorkeling qualities can’t be overlooked as well. In places like Uepi Island and Mary Island you can dabble off shore to explore alluring reefs brimming with sea life-like giant eagle rays, sharks, barracuda and batfish. As a matter of fact it has a remarkable biodiversity, containing thousands of different plant and animal species, especially the marine life. Many species are known only to the Solomons. Isla Holbox is a sleepy island off Mexico’s Yucatan Peninsula. The spot offers amazing and memorable experience to its visitors. According to Ted Martens, vice president of marketing and sustainability with Natural Habitat Adventures – it is the world’s top destination for whale shark swimming. He went further to say that the giant creatures are really not harmful. The whale sharks swim close to the surface and feed on plankton during the summer months and this the best time for visitors to swim close to the wide fish some of which can reach up to 18 meters (60 feet) in length. The island is popular for its sound eco-tourism activities.